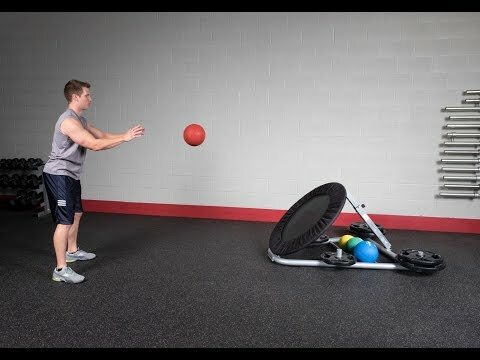 Medicine ball rebounders are like small trampolines that are designed to make medicine ball exercises easier. 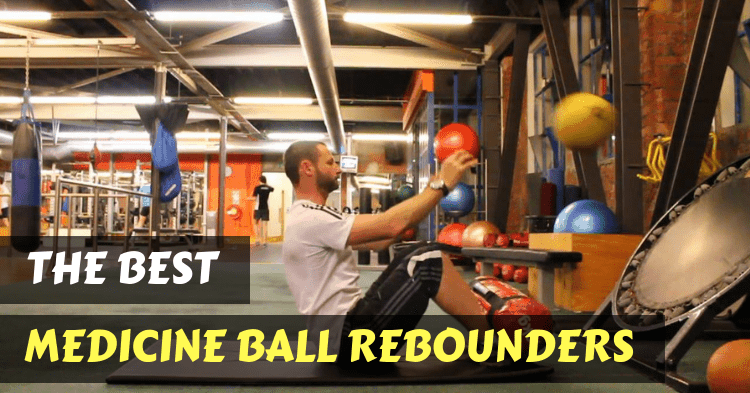 Medicine balls are meant to bounce, and with the rebounder, you can make the reps in a core circuit much faster and improve your conditioning. This article is about 5 of the most popular examples on the market, what their pros and cons are, and what you should be looking for. This is a versatile piece of equipment and getting this purchase right can change your overall home gym. If you’re looking to get a high-quality core workout done with a med ball, this is a great place to start! Durability: it needs to be able to sustain having a med ball thrown at it with full power. These often weigh around 20lbs and provide a serious challenge. A rebounder that breaks or tears easily is not worth your money. Stability: a rebounder that slides around on the floor when it receives impact defeats the point of purchasing it in the first place. It will slow you down and waste your energy – you may as well just use a wall at this point. Customer Service: whatever you buy, you want it to be reliably delivered with all the pieces, intact, with the option to contact the manufacturer if anything is wrong. 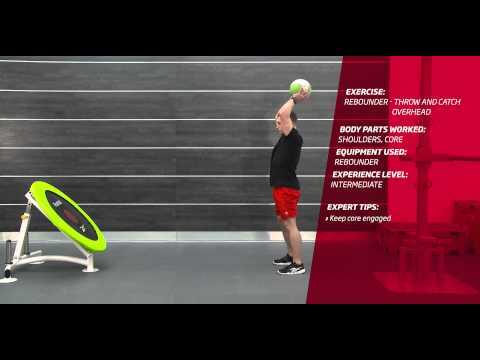 Angles and Adjustments: almost all of the products on this list are adjustable – it’s a big deal for a rebounder as the more angles it works at, the more you can vary your workout and tailor it to your specific goals. 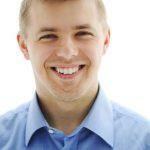 Obviously, these are very simple aspects of basic function for the product. These basics are the only real criteria we need to use – there aren’t many features to a rebounder and the ability to consistently nail the basics make a big difference. While there aren’t many reviews to speak to the benefits of the Body Solid, those that exist attest to one important fact: it’s a well-balanced and stable piece of kit. It remains attached to the floor and effective when using a 20lb medicine ball for a circuit workout and doesn’t slide around. With the persistent problems we’ve seen with other products on this list so far, this is a great start. Simply having a good grip on the fundamentals is enough to be in consideration for your money at this point. 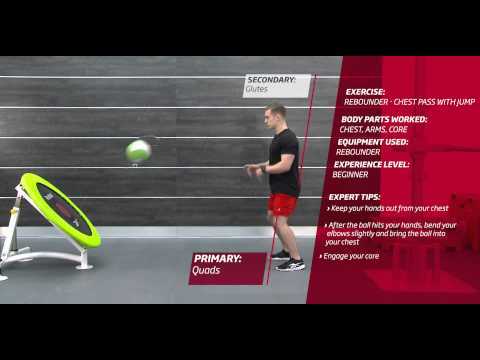 Body Solid also has their own tutorial on simple rebounder exercises you can try! The adjustments are pin-supported with a solid, well-constructed base and support lever. The amount of contact with the floor is the key factor for this product – with a low center of gravity, it’s going to be effective for rebounding even at the highest angle. Overall, we’re big fans of the Body Solid product for the innovative design, and the focus on the basics. This is a key part of making a great product – it has to do what it’s designed for effectively – everything else is secondary. There are mixed feelings about this rebounder. It seems to be an easy-to-use product with fast install times, simple features, and a reasonable price-tag. The adjustable metal arm is on a level, so you can adjust it to any exercise you happen to be performing. This makes it a great, versatile piece of equipment with a lot of exercise options. This is an essential part of any good rebounder, as it opens up uses that make it a great piece of kit for any home gym. 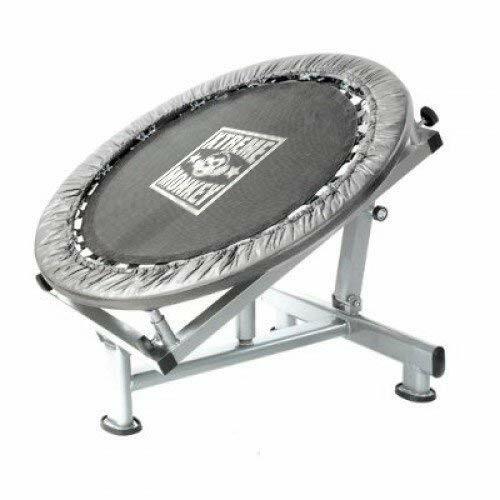 The construction is solid, and we’ve seen a lot of durability with the Xtreme monkey rebounder. It’s built with great-quality steel joints and high-quality joints/levers. If you’re getting this, it’s going to last, and you’ll probably not have to replace it (maybe ever). 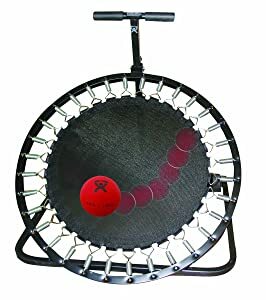 The problems with this rebounders seem to lie with how effective and consistent it is at rebounding. 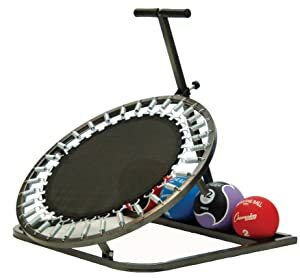 Some reviews suggest that you have to throw a medicine ball at the lower part of the rebounder or it is likely to shift around on the floor – even when supported by weights for stability. This is a concern that would be best avoided. This product is only marred by the fact that this problem can be very irritating during a workout. It’s an extra logistical problem that shouldn’t really be there – and it can really ruin your experience. This is the kind of basic, fundamental problem we’re trying to avoid. Valor is a popular name in fitness and they have a relatively positive reputation in everything from medicine balls to battle ropes. Their rebounder is another example of a well-received product, with a good average rating on Amazon of 4.5 stars. When the whole valor rebounder turns up, it’s a great product. There don’t seem to be any stability problems as seen with the Xtreme monkey, and the overall product seems to be both well-built and effective for its purpose. These are the simplest needs for the product and it fulfills them beautifully. 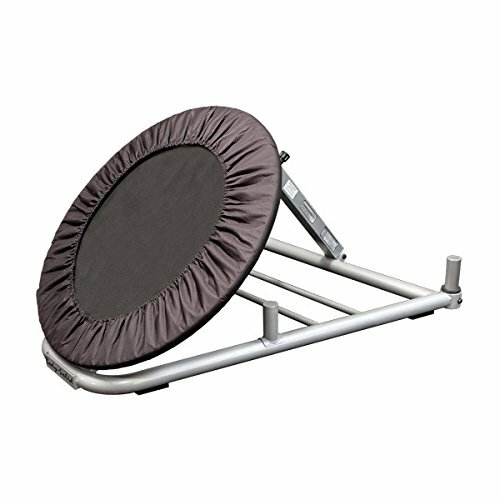 However, many customers have reported that what they got was not the full version of the rebounder. There are numerous reports of missing parts that are essential for using this piece, or easily-damaged rebounder surfaces that ruin the aesthetic of the product. This isn’t a total indictment of the product – it’s great when it arrives – but the concerns with customer service and the likelihood of getting a half-finished job is a real concern. We recommend avoiding this product if (and only if) you need it at short notice – allow some time to make sure delivery includes all parts – you might need to contact the provider if anything goes wrong. This is a bit of a let-down as the product itself is great quality for both home-gym use and commercial gyms. A great product, if you have the time to fiddle with it and are okay with the small risk of needing to contact the manufacturer. This is another example of a rebounder that has problems with the floor – it seems to slide when impacted rather than rebounding effectively. This makes it a problematic product for most home-gyms. It needs to be supported with a wall or heavy weights to prevent sliding. This is one problem that can really impact a workout and waste your time. The anchoring of the product is a big deal and the storage of it as-advertised (With medicine balls weighing it down) may be the way it has to be used. This is obviously a problem since most of us don’t own 4-5 medicine balls in a home gym. If you own sufficient weights to anchor it, the product has widely-positive reviews. As with others on this list, it is a durable piece of equipment with sturdy construction and consistently-good use at both commercial and home gyms. The problems seem to be limited to the customer service and quality of packaging/product delivered: customer service has a bad reputation, making for a worrying combination. The champion sports rebounder is the most concerning we’ve seen so far. It’s a combination of customer service problems and functional problems that make it a confusing purchase. It’s definitely struggling to compete with the others on this list so far. The CanDo also suffers with a relatively small sample of reviews – at the time of writing it has only 3, averaging a 2.7-star rating. The main problems raised with this product surround durability – something we’ve not seen with any of the other products on this list. This includes the regular sliding on the floor (unless supported against a wall), poor-quality medicine balls included, which are often simply not included. This is a concern for the overall quality of the product. Customer service problems abound in other areas – some reviews report that it’s absolutely impossible to get in touch with the manufacturer about problems, while others have had a reasonable time contacting them for information. This is a bad sign with so few reviews on the books – caution is a good idea. There’s nothing wrong with this product, much like others on this list – we’ve simply got concerns about stability, customer service, and the quality of the balls that are supposed to come with it. We’d recommend always buying your own medicine balls to ensure quality all the time. Overall, however, this does put it below other on this list for basic functions and quality. The problems with some of these products are so big that they really take them out of consideration for being a good choice on the market. Instability really isn’t acceptable for a rebounder – it’s designed to have med balls thrown at it. There’s no room for instability when you’re going to be using this as a key part of circuit/core training. Stability and construction quality are our number one concern – for this reason, the Body Solid is our favorite rebounder. It lives up to the name with a solid floor-contact, great quality build, and stability when it matters most. 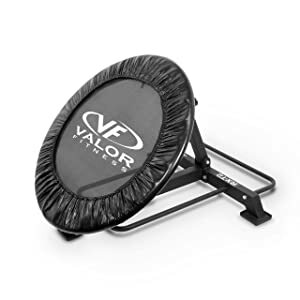 Another product that has similar functions is the Valor Fitness rebounder. This is another great product, but it does seem to struggle with consistent reports of missing parts – something that can be a real problem since it’s for a home gym and relies on your hard-earned money. Keep it simple, get something that’s reliably great, and you’ll only need to buy one.